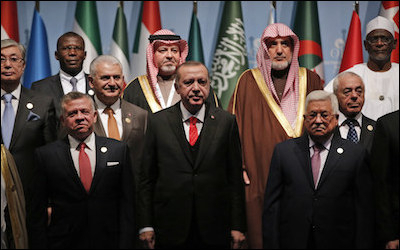 Turkish President Recep Tayyip Erdoğan (center) with the leaders of other member states at the Organization of Islamic Cooperation (OIC) summit in Istanbul, Turkey, on December 13. Last week in Istanbul, the Organization of Islamic Cooperation (OIC) recognized East Jerusalem as the capital of Palestine. They made the announcement with a barrage of angry rhetoric, of course. Israel is a "racist" state, and the Trump administration's recognition earlier this month of Jerusalem as Israel's capital is "an attack on the historical, legal, natural and national rights of the Palestinian people, a deliberate undermining of all peace efforts, an impetus to extremism and terrorism, and a threat to international peace and security." Look past the bombast at the main point. By recognizing East Jerusalem as the capital of Palestine, the OIC is effectively ceding West Jerusalem to the Israelis and implicitly recognizing it as Israel's capital. By recognizing East Jerusalem as the capital of 'Palestine,' the OIC effectively recognized West Jerusalem as Israel's capital. Foreign policy analysts who opposed Donald Trump's recognition of Jerusalem as Israel's capital had a hard time understanding what strategic objective the president was attempting to advance, partly because, in all likelihood, he wasn't trying to advance one. His interests were largely domestic. Former presidents Barack Obama, George W. Bush and Bill Clinton all promised to recognize Jerusalem as Israel's capital and move the US Embassy there, as the US Congress has required by law since 1995, but none of them followed through. Trump did. He alone fulfilled four presidents' campaign promises. That doesn't mean a strategic objective wasn't advanced, though, even if the president doesn't understand it and didn't articulate it. He, along with the OIC now, punctured a delusion on the Palestinian side that makes peace in the short and medium term all but impossible. Plenty of Palestinians want the conflict to end and will grudgingly live alongside Israel even if it means giving up the dream of sovereignty over the entire land between the Jordan River and the Mediterranean. According to a survey published in August, 53 percent of Israelis and 52 percent of Palestinians support a two-state solution. Too many Palestinians would brand PA President Mahmoud Abbas a traitor if he were to engage in serious peace talks with Israel. At least some in the Palestinian National Authority leadership are among that 52 percent. If President Mahmoud Abbas—who is currently finishing up his twelfth year of a four-year term—could push a button that magically created a Palestinian state that roughly corresponds to the 1967 armistice lines and leads to an enduring and stable era of peace with the Israelis, he would probably push it. He has never agreed to peace terms with Israel, though, nor is he even open to serious peace talks, because a huge number of Palestinians—especially the armed total rejectionists in Hamas—would brand him a traitor. The dream, the fantasy, of destroying Israel hasn't died yet. The notion that the so-called Zionist Entity is an ultimately temporary imposition remains all-too powerful in the Palestinian national narrative. 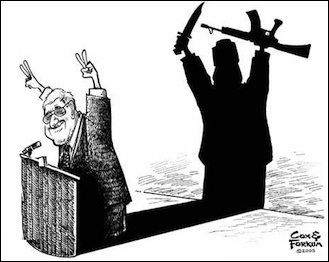 Peace is not yet nigh, and Mahmoud Abbas knows it. Even the two-staters would blow a gasket if Abbas were to sign a peace treaty and concede what the Israelis would force him to concede—no "right of return" for Palestinian "refugees" who have never even set foot in Israel, the West Bank, or Gaza; and Jewish sovereignty over the Western Wall. Odds are high that Abbas would be killed or driven into exile and that yet another war between the Israelis and Palestinians would break out soon after. Israel's permanence must be part of the story Palestinians tell themselves about their place in the world and in history. Israel's permanence needs to be part of the story Palestinians tell themselves about their place in the world and in history, and right now, it's not, at least not among enough of them. The Palestinians, as a whole, aren't likely to be honest with themselves about this before the wider Islamic world is honest about it first and pressures them to say yes and build the sovereign state that is actually possible rather than continue to pine and sometimes fight for a castle in the air. Most of the Arab states have quietly set the conflict aside, but they're afraid to speak truth to the Palestinians, afraid to be branded betrayers, afraid to risk popular wrath and go the way of Egypt's assassinated Anwar Sadat, afraid to apply the kind of pressure on Palestinian negotiators that ultimately will be necessary. In an alternate universe, the Israeli-Palestinian conflict is a post-Soviet-style frozen conflict, but in this one, the Syrian and Iranian regimes keep poking it with a stick by funneling guns, money and even missiles to terrorist armies like Hamas and Hezbollah. The likes of Hamas absolutely took note that the OIC thinks only East Jerusalem belongs to the Palestinians. That's why it matters that the OIC just implicitly recognized West Jerusalem as the capital of Israel. They didn't say it in a way that will get them in trouble back home, but the likes of Hamas and Hezbollah absolutely took note that the OIC thinks only East Jerusalem, and not the whole thing, belongs to the Palestinians. They would not have done this had the United States not done it first. It's a small step, sure, so don't go popping any champagne corks just yet, but it's still a step.